Rachel Ferguson, an aspiring Texas entrepreneur, has officially launched a Kickstarter campaign for ‘Mustang Cafe’, a family friendly coffee shop in Magnolia Texas. 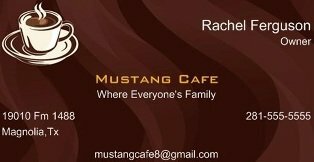 Houston, TX - Rachel Ferguson, an aspiring Texas entrepreneur, has officially launched a Kickstarter campaign for ‘Mustang Cafe’, a family friendly coffee shop in Magnolia Texas. The Kickstarter campaign aims to garner widespread support and financial backing to fund the grand opening of the Mustang Cafe. Located just an hour outside of Houston Texas, Magnolia Texas is a city with all the charm of small town USA, but offering a world of opportunity for businesses and residents. It’s with that same charm and sophistication that Rachel Ferguson intends to enter the gourmet coffee shop business with Mustang Café. Featuring a covered patio with outdoor seating and relaxing indoor vibe, family owned & operated Mustang Café will be committed to delivering the ultimate coffee experience. Mustang Cafe will provide customers with a large range of coffees including a complete menu of espresso-based beverages such as lattes, cappuccinos, smoothie chillers, cocoas and gourmet teas. Whichever Mustang Cafe Beverage you choose, you can be sure it will be freshly crafted in the store using the highest quality ingredients. Ferguson intends it to be a difference every customer will taste and appreciate. Mustang Cafe will use the finest and freshest beans available in the industry. Its freshly brewed coffees, such as café latte, are created to meet the highest standards. “My biggest challenge would be the coffee giant "Starbucks" that's located 15 minutes down the road. The business will overcome this obstacle because our prices will be lower and it will be a friendlier environment. More family feel less corporate feel.” Said project creator and shop owner Ferguson. Ferguson intends for Mustang Café to be active in the local community. Participating in the Magnolia Farmer’s & Artisan’s market, Renaissance Fair, Magnolia Stroll and various youth sporting events, concerts and Plays. “I am a stage 4 cancer fighter soon to be survivor [and] I have always dreamed of owning my own business [and] I decided a coffee shop would be a nice thing to have in my community,” says Ferguson. Kickstarter is a funding platform for creative projects. Everything from films, games, and music to art, design, and technology. ‘Backers’ who support a project on Kickstarter get an inside look at the creative process, and help that project come to life. All ‘Backers’ of the Kickstarter campaign who pledge $10 or more will be eligible to receive rewards such as T-shirts, plaques and bags of Mustang café coffee.